What compelled you to restore the hotel? What was your driving force? We have a strong family connection to Saranac Lake and vacationed there for years. My mom grew up there. 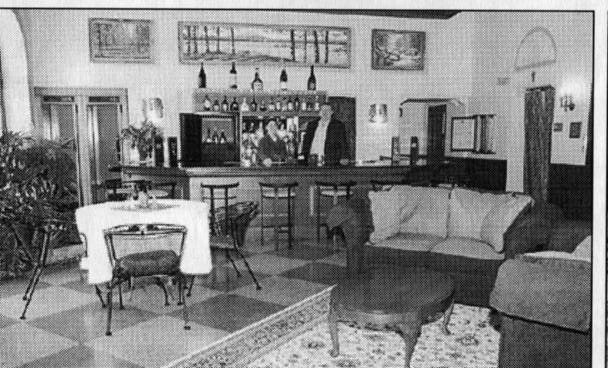 The hotel was a place that was in need of a renovation, but still a home to people to celebrate everything such as weddings and proms. 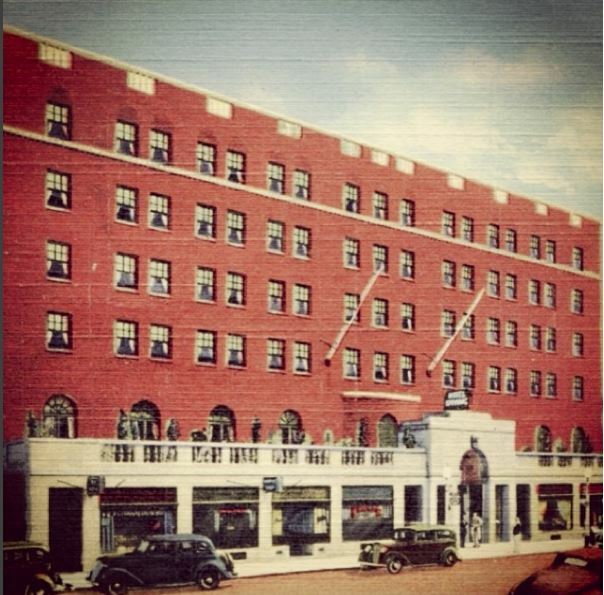 What challenges did you meet in trying to preserve the historical nature of the hotel while appealing to today’s traveler? There were many things we might have done differently if this was a new building and didn’t have tax credits associated with it. For example, we had to create some ADA guestrooms by transforming some traditional rooms to meet this important requirement. Also, some rooms are tiny by today’s standards, some fewer than 10 feet wide. To get the critical tax credits that made the project viable, we could not take walls down. 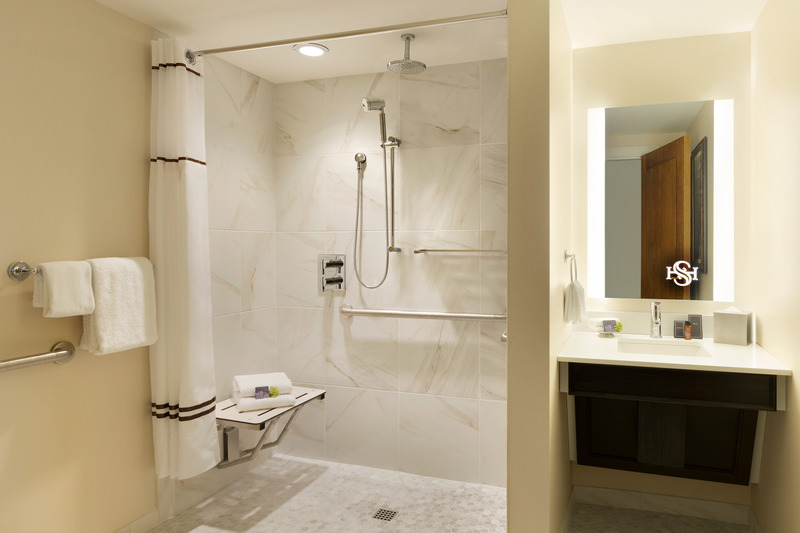 That meant guestroom bathrooms that are 4’x6’ remain. That was quite a challenge for the designers and construction people. There were no sprinklers or HVAC, which had to be installed. But we figured it out and the result is stunning. Thankfully we had Samuelson to create incredible casegoods that are more like millwork pieces. There are no standard rooms here and we decided to feature headboards from floor to ceiling, hiding electric behind crown molding and within the case goods. And of course, we added electric outlets to every room. What types of things did you uncover during the renovation? We found layers and layers of things. For example, we brought back beautiful French doors that had led to the terrace over the years. 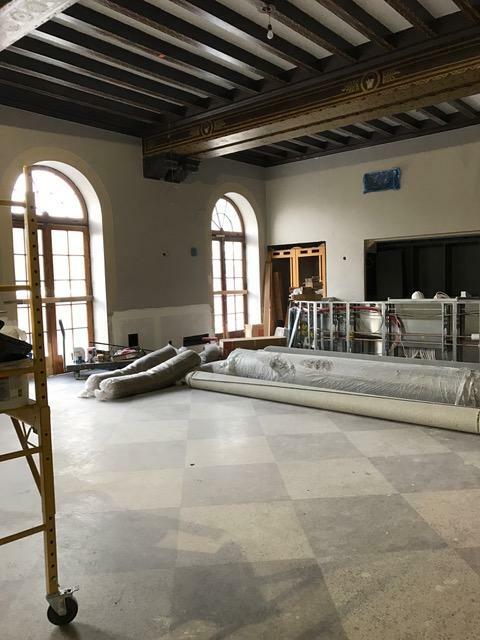 Also noted, while removing sheet rock from the ground floor lobby area, the “arcade” as it was known back in the day was revealed with original plate glass windows complete with law office lettering; the old news stand; the former barbershop and beauty parlor area; even a concealed stairway. 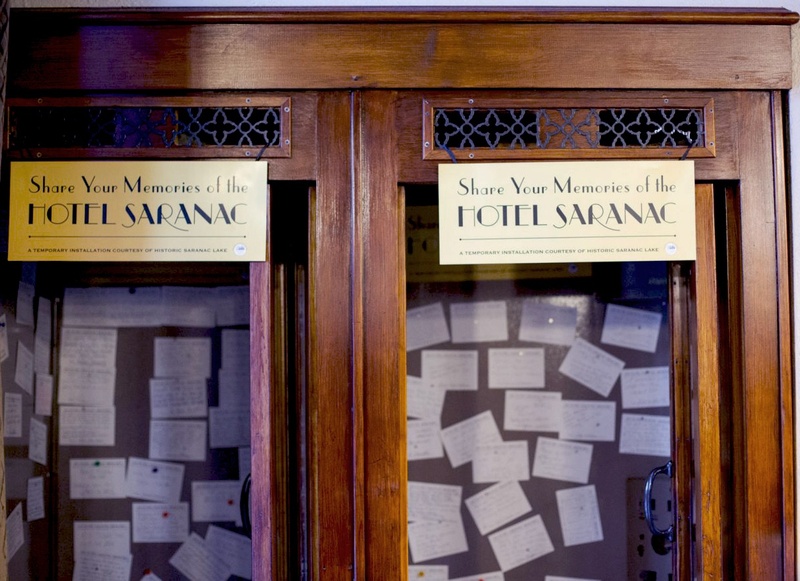 Preserved, among numerous other treasures are the vintage brass letter-drop and two phone booths now used to post visitor’s memories of the hotel. What updates were made to the historical features you maintained? We did as much as we had to do, such as fixing a leaky roof that caused some spaces to get destroyed. The Great Hall had plaster beams with intricate detailing the water had damaged. We also pulled up carpet revealing a rare herringbone floor, which we brought back and kept all original. There was lots of terrazzo in public spaces, which was pitted over the years. We had to sand it down, fill it and make it conform to the character. If you didn’t use a historical element (or were forced to remove something), did you represent it somehow? How are you representing the history within the hotel? We wanted to make sure the architectural parts stayed old. But we didn’t buy 1920's furniture. We wanted the furniture to feel new and fresh and let the architecture accentuate the historic. We were careful not to make everything look brand new. 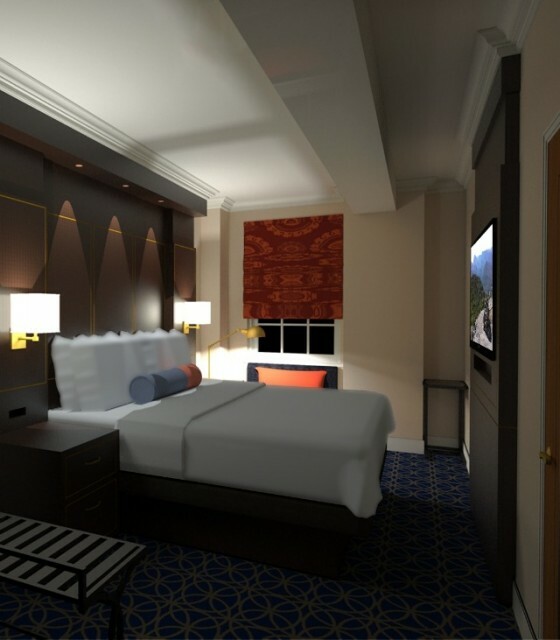 How did you create the feeling of space in the smaller guestrooms? We were very conscious of that. We knew we had things we had to do like the electric and as I mentioned earlier used custom furnishings very effectively thanks to Samuelson. High ceilings here also help create the sense of a larger space. Getting the final result required many renderings so we could understand the space before we bought anything to put in it. In the bathroom, we did very well. We removed bathtubs and replaced them with a glass door for the shower. We also designed a vanity, which is compact and created an extension of the vanity for more counter top space. Every guestroom element was analyzed, and we focused on the height of pieces to see how those would affect the feeling of the room. We even focused on how the carpet pattern works. Plus, we included Roman shades to create more height and featured big patterns on carpet and fabrics too. What statement were you trying to convey with furniture design choices? The rooms had no personality whatsoever, so we wanted to bring the dark wood found in public spaces into the guestrooms, as well as reflect what we found within the Great Hall. In that space there are 16 symbols representing activities in the area which we chose to bring back into the guest artwork. Overall, we wanted the room, and the furniture within it to be new and modern but reflect the historic aspect which the rooms previously didn’t portray. Are travelers booking because it’s historic, is that a draw? In what ways have you tried to reflect that in modernizing it? Where did you put the emphasis on the preservation while making those changes? We’re trying to get a finger on that now. There is a market of people seeking out staying at historic hotels. Also, people within the community have history in the hotel and they are coming back to experience it once again. Are people traveling to the hotel mostly for vacation or business? 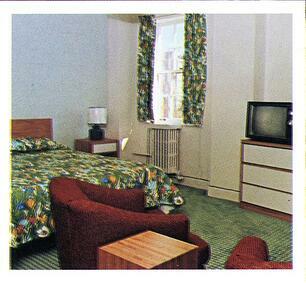 What furniture elements were important for you to include in the guestroom? 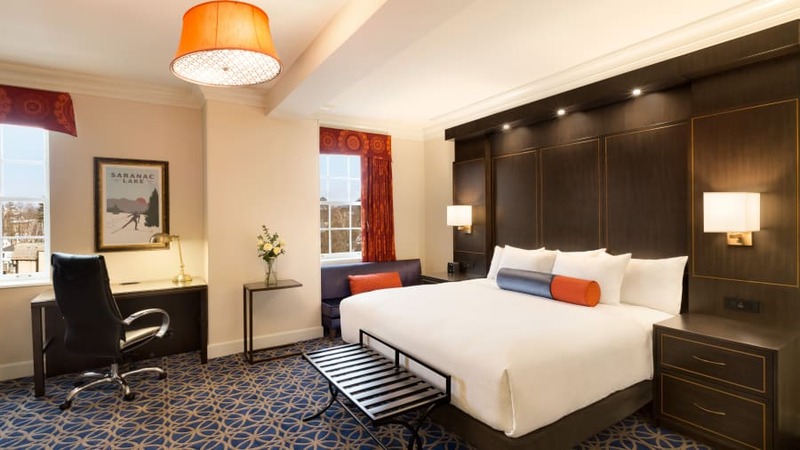 How does the design of the guestrooms cater to the guest? We took a hard look at millennials and they seem to be the hardest to please. They need power ports and Wi-Fi, and Smart TVs. We spent a lot of time looking at those needs and that lined up with our brand strategy. We’re also renovating the two buildings adjacent to the hotel which will be all suites. That will help us with securing social and corporate business. What guidelines do you have to maintain to be use a hotel brand? We are a Hilton Curio Collection hotel and that allows us to use a lot of customization to tell our story. We brought that story to life through our historic elements and maintaining the existing architecture. 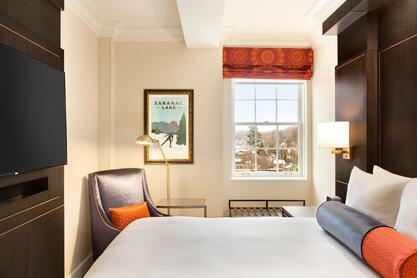 How did selecting Hilton Curio, a boutique brand, affect the design of the project? Incredibly, they came back liking everything. We were so pleased they approved our design direction. What advice do you have for designers starting a historical preservation project? When you do it, you think it will never end. Guess what? One day you’ll look back and miss it; we do. More practically, getting to really truly understand the history of the building, the community, and what makes it all tick is key to a successful project such as this because it helps you understand what is important and visualize it. Most important, reviving the Hotel Saranac been the most professionally rewarding thing I have ever done in my life. It was an honor to be a part of this incredible experience. What tips would you give a designer taking on a historical restoration project? Comment below! 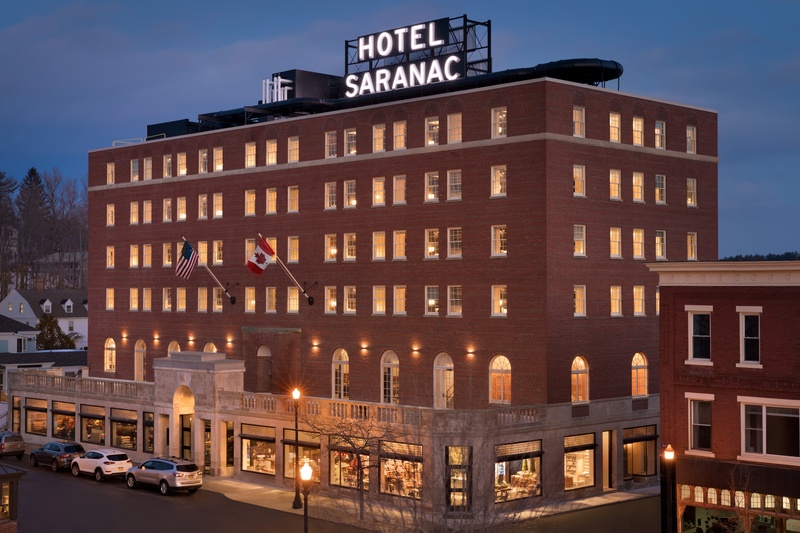 Receive a coupon code to use for a stay at The Hotel Saranac! Read our newest Comic Strip- The Bridal Suite!